Trust level 1 (Basic) is where most new user restrictions are lifted. You can now send PMs, upload images and attachments, flag posts, etc. This will pop open a new panel for creating a topic. Here you select a title for the topic, choose its category, select the tags, and write out the body. When creating a topic make sure that your what your posting has not already been posted before. This avoids clutter and keeps relevant information together in the same space. A good topic title should be something that is short and concise with the body of the topic filling in the details. A correct category will let people find your post easier and let relevant experts identify where to point their knowledge. The body of a post should contain all of the gory details of your post. This doesnt mean it has to be many paragraphs but it should be all necessary information. Markdown is discourses preferred method of handling text with their being support for BBcode as a plugin. This lets up do some fairly advanced things with the text. 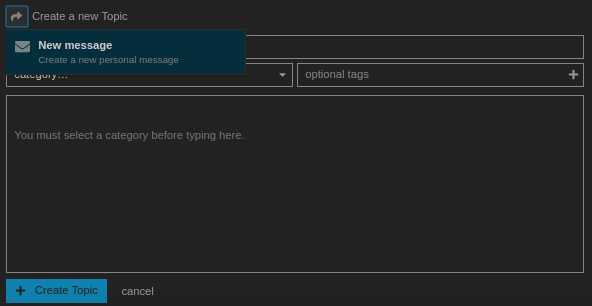 Discourse has auto formatting buttons that will help you do some of the text formatting. These dont contain everything but has most of the basic stuff. On the right side of the topic you have the scrollbar. At the top of the scrollbar is the topic start date and the bottom is time of last reply. The left button is used to reply to the topic and the right button is used to set the notification level. At the bottom of the topic is the rest of the topic controls. You can bookmark the topic, share it with others, flag the topic for staff review and reply to it. Below that is the notification level for the topic. There are 4 notification levels a topic can have. Watching where all replies notify you, tracking where replies to you notify you, normal where you only get notified if you get pinged, and muted where the topic is silenced. By default a topic you create will be at watching level. You can interact with a post in a few basic ways. Liking it, sharing it, flagging it, and bookmarking it. Likes can be fairly limited at a low trust level so dont go ham liking everything. You can also quote a post but selecting the text you wish to quote and selecting the quote button. You will receive a PM with a gunzipped CSV file. This will contain ALL posts including PMs. When a post had been edited there will be orange pencil at the top right of a post. Click this to see all changes made to a post. On the left side of the screen will be your before and the right side is the after. Green text is stuff that was added and red text is stuff that is removed. You also have the option of being able to view the post in raw form where you see markdown text. Not sure if you want any input. I have a few notes I’ve kept that I don’t see here. avoiding HTML because its technically not supported by discourse. Is better to use the markdown version.